There are 68,000 kilometres of sewers under central London. Venture down into the sewers of modern London, and along with the obvious effluence you'll find discarded kitchen fat that has congealed and hardened against the cool stone, tissue paper and wet wipes that refuse to dissolve, and rats. The last, at least, are regarded with a kind of respect by the sewer workers, who are known as flushers. There was a time when the capital's sewage system ran overground. When the Great Fire of 1666 facilitated Sir Christopher Wren's magnificent rebuild of the City of London, it was akin to slipping a clean petticoat over soiled knickers. By 1810, the city's one million inhabitants had to be content with 200,000 cesspits. The eighteenth century had been a time in which London had suddenly begun to expand in size. Its more wealthy inhabitants wanted to escape the overcrowding and the noise and filth of the city - which in essence still occupied the area inside the old Roman walls - so they purchased plots to the west. Within half a century the 'west end' of London has been laid out, between the site of the former Savoy Palace on the banks of the Thames and the Tyburn gallows out by the location of the old Roman marble arch at the far end of Oxford Street. New streets, such as Savile Row, Baker Street, and Regents Street were filled with grand houses. As the owners of these new houses moved out of the city itself, the working population there quickly filled the gaps. Their numbers swiftly doubled, but the old cesspits were unable to cope with this increase in numbers, not to mention the new flush toilets being used by the wealthy, and so the effluence overflowed into the rainwater drains and straight into the Thames. 'Since much of the capital's drinking water was drawn from the river, the citizens of the metropolis were literally drinking one another's sewage,' wrote Stephen Halliday in his book, The Great Stink of London. While the physician John Snow had linked outbreaks of cholera in Soho, in 1854, to water pollution, many still believed that the disease was spread through foul smells. The 1853-54 outbreak of cholera was one of the worst, killing over 10,000 Londoners. And in the long hot summer of 1858, it was as foul as it could get. As the Thames began to dry, the current slowed to a stop and began to putrefy. A vile miasma, derived not only from sewage but also dead animals and slaughterhouse entrails seeped from the stagnant river into the Houses of Parliament. The later prime minister, Benjamin Disraeli, himself ran from the chamber branding the river 'a Stygian pool reeking with ineffable and unbearable horror'. What today would be referred to as 'harmful emissions' had nothing on the crisis that came to be known as the 'Great Stink'. The politicians had to act. This was to be Sir Joseph Bazalgette's finest hour. As the chief engineer to the Metropolitan Board of Works, Bazalgette today seems to have been forgotten, unlike his contemporary, Brunel. 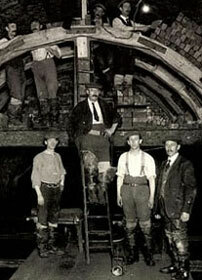 Five years were allotted to build the sewers at a cost of £3 million, with a thousand labourers handling the work. 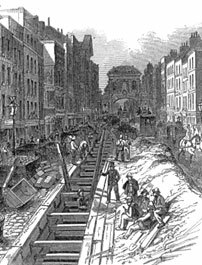 In a very short time, Bazalgette managed to lay eighty-two miles of intercepting sewers parallel to the Thames, and 1,100 miles of street sewers, although the final cost came in at £4.2 million. Work started in 1859 and was completed by 1868, a major achievement for its time, despite not fulfilling the original timescale. 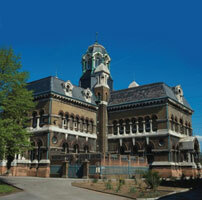 Although London's tilted topography aided drainage, two pumping stations needed to be built to the east, one at Crossness on the south bank of the river, the other at Abbey Mills near West Ham. The opening of Crossness, near Thamesmead and Plumstead, in 1865, was attended by the Prince of Wales and other dignitaries. Constructed in the Romanesque style, it was a cathedral to Victorian endeavour. Over a hundred tonnes of cement and sand, piled into the site to halt the leak of methane gas, were excavated. Abbey Mills didn't get a grand opening. 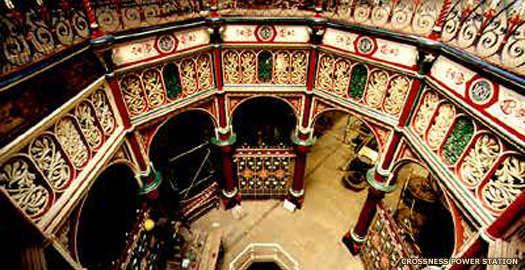 A twenty minute walk from West Ham Underground station (itself opened thirty-seven years later, in 1902), along a desolate stretch of land called the Greenway, Abbey Mills' Station A is a typically Victorian mash-up of Byzantine, Italian Medieval, Flemish, and French Gothic styles. Station B has been more recently used as a film location. The job was made harder by having to work alongside the developing underground railway system and emerging above surface railway systems. Bazalgette used 318 million bricks to create the underground system and dug up more than 2.5 million cubic metres of soil. To avoid tunnelling under the West End, Bazalgette reclaimed land by the Thames to create the Victoria Embankment. A number of the lamp posts along the Embankment still bear the 'MBW' (Metropolitan Board of Works) emblem. Part of the River Fleet, some of which had been covered over as early as the 1730s to the south of King's Cross, was also incorporated into the new sewer system, with its major outfall at Blackfriars Bridge. 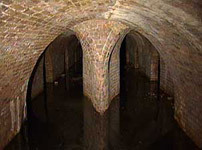 As Bazalgette anticipated population increases when he designed the sewers, it was only by the early twenty-first century that his system needed to be renewed. The underground grid remained unchanged for 150 years, but it had been estimated that from 2015-2020 the population of London would increase by the size of the population of Leeds. The next stage in supplying London with sewers was the Thames Tideway Tunnel, which was initially expected to be complete by 2012. In fact construction was delayed until 2016, with an estimated completion date of 2023. In more recent years, visitors to the sewers needed to be careful, and not just in avoiding the waste they would find down there. Walk in the wrong direction underground and a visitor may come face-to-face with the nozzle of a gun, as the sewers beneath Downing Street and Buckingham Palace are heavily guarded. As for Bazalgette, while he is relatively unknown today, he does have a statue on the Embankment which he himself designed, to the left of Jubilee Bridge and in the shadow of the London Eye. Text copyright © P L Kessler & original author(s). An original feature for the History Files.